We’ve said it before and we’ll say it again…those Brits know a thing or two about green beauty. (Read: all the things.) 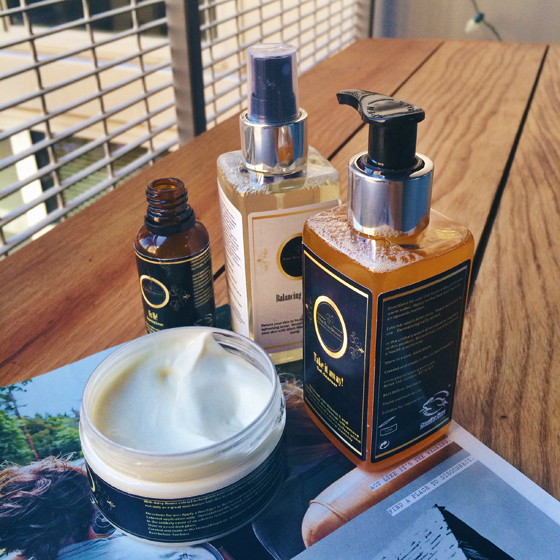 There are so many London and UK-based skincare, bath, body and beauty lines that we covet. So, we were pretty pysched when newcomer Yours Truly Organics reached out to us about trying their products. This should tide us over (for a few months, anyway) while we continue to save our pretty pennies for an overseas green beauty JAMBOREE. Or maybe our UK-based bloggers pals can just Skype us in. We can dream. The line consists of the Take It Away! Gel Cleanser (£22 or $37 for 150 ml), Balancing Toner (£19 or $32 for 150 ml), Fix Me! 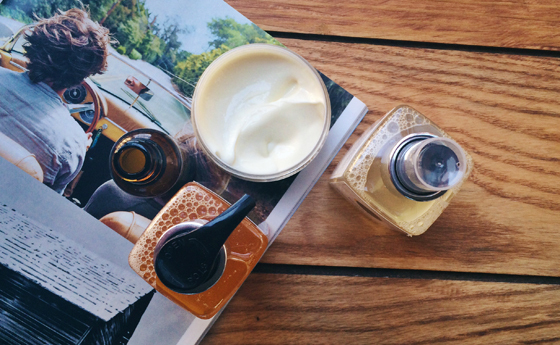 Repairing Serum (£28 or $47 for 30 ml) and Face Base Face Balm (£25 or $42 for 100 ml). Overall, the line feels fresh and is very moisturizing. And the products aren’t skimpy – meaning that the gel cleanser is a thicker consistency than other natural cleansers we’ve used; the serum isn’t just a light oil – it’s a nearly opaque, gooey serum that dries matte; and the moisturizer is a thick lotion that also sets matte and makes a great, non-oily make-up base. Though the products themselves are substantial and feel heavier than we’re used to, we both agreed that the line doesn’t weigh our skin down. And the moisturized yet matte finish you’re left with is a huge plus. Did we mention these products smell GREAT? Citrus-y, so fresh and so clean clean. The products are cruelty-free and bear the Ecocert label, which covers a lot of ground – Ecocert cosmetics must use sustainable packaging, can’t utilize GMOs, parabens or a bunch of other undesirable and non-natural ingredients, and more. I’ve been reaching for this cleanser over and over again. Similar to One Love Organics’ Easy Does It Foaming Cleanser, this liquid gold (to clarify…there’s not actually gold in there…I’m talkin’ color here, folks) is entirely reminiscent of the sudsy face washes I used for the majority of my life thus far, but without the harsh foaming agents and hidden nasties. Sign me up! This gel cleanser has some thickness to it (hence the “gel”) and applies silky and slippery, not sticky. I rinse it off with a few splashes of water, and it leaves skin moisturized, not stripped. Maybe I’m bad/lazy with rinsing, but I find it leaves behind a little moisturizing layer on my skin. Which I enjoy. Plus, I benefit from the lingering citrus scent of this cleanser…brought to you by orange oil. Among its other ingredients (Yours Truly reports 99% of them come from natural origin) is sandalwood oil – an oil I hadn’t encountered before! It has cleaning and astringent properties. MAKES SENSE. 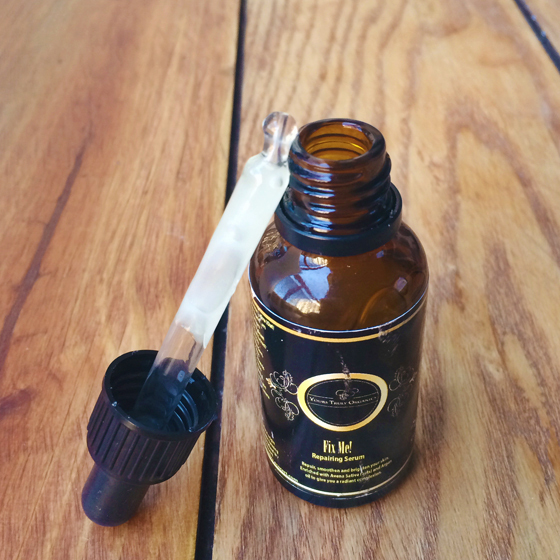 This serum feels like an enriching treat. Like I’m doing my skin a favor. After a few days of using this, I noticed clearer, more buoyant skin. My skin felt like it had more glow to it. I’d catch myself in the mirror and wonder if it was a fluke. It was not. A waiter at a restaurant stopped in front of me and said, “Your skin is RADIANT.” Given that I was not wearing ANY base foundation whatsoever (it was brunch, sue me) – I took this as a good sign. It’s not everyday a stranger compliments you on your skin. Eh?! Aqua (Water), Lauryl Glucoside, Cocamidopropyl Betaine, Decyl Glucoside, Polyglyceryl-4 Laurate/Sebacate, Polyglyceryl-6 Caprylate/Caprate, Glycerin**, Glyceryl Laurate, PCA Glyceryl Oleate, Sodium Chloride, Shea Butter Polyglyceryl-6 Esters, Santalum Album (Sandalwood) Oil*, Xanthan Gum, Aloe Barbadensis Leaf Powder*, Simmondsia Chinensis (Jojoba) Seed Oil*, Dehydroacetic Acid, Helianthus Annuus (Sunflower) Seed Oil, Bixa Orellana Seed Extract, Tocopherol, Limonene***, Benzyl Alcohol, Citrus Aurantium Dulcis (Orange) Oil*. Aqua (Water), Hamamelis Virginiana (Witch Hazel) Flower Water*, Polyglyceryl-4 Caprate, Glycerin, Saccharide Isomerate, Aloe Barbadensis Leaf Powder*, Punica Granatum (Pomegranate) Seed Oil, Dehydroacetic Acid, Lavandula Angustifolia (Lavender) Oil*, Pogostemon Cablin (Patchouli Oil)*, Cymbopogon Citratus (Lemongrass Oil)*, Maltodextrin, Oat Beta Glucan, Sodium Benzoate, Citric Acid, Sodium Citrate, Potassium Sorbate, Levulinic Acid, Sodium Levulinate, Benzyl Alcohol, Citral***, Linalool***, Geraniol***, Limonene***. Aqua (Water), Polyglyceryl-4 Caprate, Avena Sativa (Oat) Kernel Extract*, Alcohol, Xanthan Gum, Argania Spinosa Kernel Extract (Argan Oil), Aloe Barbadensis Leaf Powder*, Serenoa Serrulata (Saw Palmetto) Fruit Extract, Sesamum Indicum (Sesame) Extract, Simmondsia Chinensis (Jojoba) Seed Oil*, Onopordum Acanthium Flower/Leaf/Stem Extract*, Dehydroacetic Acid, Cymbopogon Martini (Palmarosa) Oil, Limonene***, Benzyl Alcohol, Geraniol, Linalool***, Citral***, Citrus Aurantium Dulcis (Orange) Fruit Extract, Citrus Aurantium Dulcis (Orange) Oil*, Citrus Sinensis (Sweet Orange) Oil*, Citrus Aurantium Amara (Bitter Orange) Oil. Aqua (Water), Prunus Persica (Peach) Kernel Oil*, Theobroma Cacao (Cocoa) Seed Butter*, Bellis perennis (daisy) flower extract**, Simmondsia Chinensis (Jojoba) Seed Oil*, Glyceryl Stearate Citrate, Organic Glycerin**, Theobroma Grandiflorum (Cupuacu) Seed Butter*, Coco-Caprylate, Cetearyl Alcohol, Citrus Sinensis (Sweet Orange) Oil*, Aloe Barbadensis Leaf Powder*, Xanthan Gum, Benzyl Alcohol, Dehydroacetic Acid, Potassium Sorbate, Punica Granatum (Pomegranate) Extract*, Cucumis Sativus (Cucumber) Fruit Extract*, Pisum Sativum (Pea) Extract**, Cyclodextrin, Limonene and Linalool. 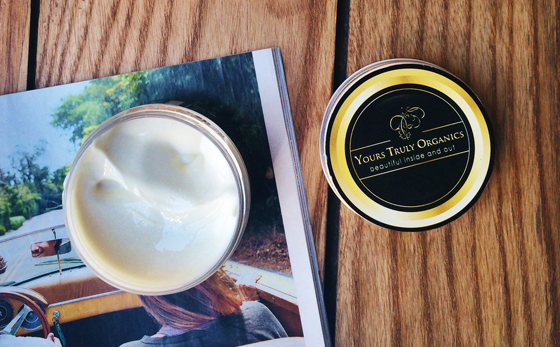 **The Yours Truly Organics products featured in this post were generously sent to us for review by the product manufacturer. Check out our policy on product reviews. Loved reading this post as I too, tried these products so its interesting to see how things work for different people. My favourite product are the toner and the fix-me serum! Luckily for me, I received a full size of the serum in a beauty box a couple months back so I have a back-up for when I run out, woo woop! Totally agree, UK brands are killin’ it in the green skincare world! Sometimes I just lust over all the brands and products I wish could be available in the U.S. I’m intrigued by the gel cleanser, sounds like it’s be really nice for my dry skin. Love the cute product names and packaging too. Thanks for putting this brand on my radar! YES count me in! That’s actually an amazing idea…lol Ahhh Australia, definitely so many cool organic/green happenings down under. I’ve always wanted to go. Enjoy! The only other one I remember is Olie Biologique’s 005 serum. I was skeptical at first when I saw it’s in the ingredient list, as I don’t really fancy sandalwood scents. But it turned out to be great for preventing spots! I have been using these products for a little while and will write soon about it. Totally agree, UK and US have lots of beautiful green beauty brands, really nothing to envy to France. I can’t wait to get to London and go to town on these UK brands! !